“It’s too complicated, and you could never explain it.” These were my husband’s words when I asked him if he thought it would be a good idea to write about Maria and Jose’s wedding in Belize. Despite his misgivings, I decided to challenge myself and bring a slice of the experience to my readers. There were just too many funny, interesting and goofy things that occurred at our house before, during and after the celebration, I felt compelled to share! I have never hosted a wedding in my home before, but in my former life I catered many parties and know the downside and the merits of doing so. On the one hand there’s the possibility of bad weather and the 50 strangers traipsing through my house. However, the cost savings and personal touches and intimacy of having a wedding at my own home were too tempting to pass up. Especially considering the couple getting married was Jose, our trusty handyman who lives downstairs and dear Maria, one of my favorite people in Belize (she taught me my favorite recipe for Arroz con Plantanos). 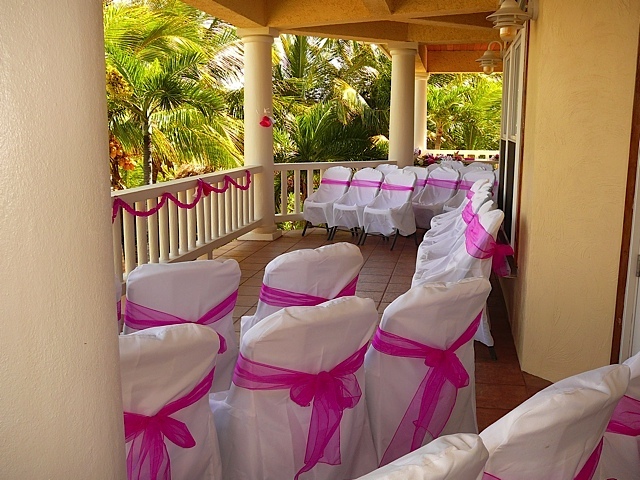 Jose rented tables for food served outside, and procured a caterer – the ever popular Palapa Bar down the beach, owned by friends Jodi and Scott. He found a Justice of the Peace and arranged for Maria’s family to come by Water Taxi from Corozol to San Pedro and to stay at AkBol Yoga Retreat, a short walk from our house. I must admit I feel out of sorts if I don’t have a timeline and checklist for hosting any kind of event. So when I looked at the clock and it was only two hours before the 4 pm wedding, I was alarmed to note that Maria didn’t have her hair fixed, her dress was still hanging in the closet, the outside serving tables were not decorated, and bags and bags of paper goods were still down in her apartment . I kept telling myself, “This is not your wedding. You are not in charge.” Easy to say but I felt very, very uneasy with how things were going down. Miraculously, the police officer’s wife came and decorated all the tables inside and out, a hairdresser down the road arrived with her hot curlers, tables were set and the wedding came together. The only glitch was that we forgot to tell the bride when it was time for her to make her appearance! After a few minutes, this was remedied as well. I was thankfully reminded that, in Belize, time moves more slowly and everything always works out. When the bride throws her garter, the man who catches it has to replace it on the leg of the single woman who has caught the bridal bouquet…WITH HIS TEETH. I am not making this up. After each wedding toast, the crowd chants “BE-SA, BE-SA, BE-SA” (meaning “kiss, kiss, kiss”) and the bride and groom have to kiss. The ceremony began about 40 minutes later than planned and after hors d’oeuvres, a few toasts and delicious meal the party got into full swing around 7:00 pm and didn’t end until 1:30 am. Whew. What a night! The next day, it took four of us six hours to clean, mop the floors, replace the furniture, and get the house back in order. But it was all worth it. 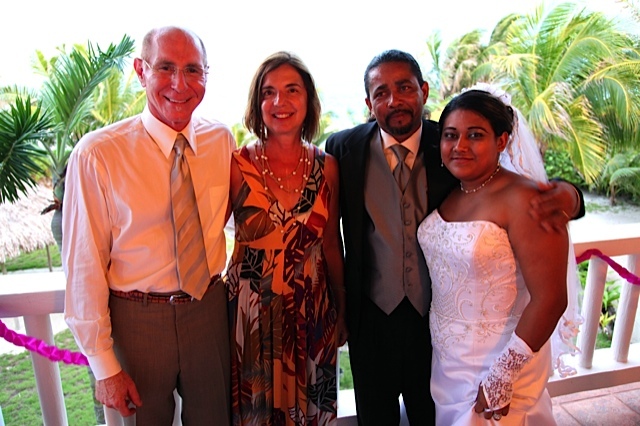 I don’t know that I’ll ever have the occasion to hold another Belizean wedding in my home and my husband and I were honored to help this beautiful couple celebrate the beginning of their married life together! Mash garlic and shallots with salt. Mix in the rest of listed ingredients and coat the chicken. Marinate a minimum of four hours or overnight in a covered container or zip lock bag in the refrigerator. Remove chicken from marinade. Place on foil lined or parchment lined rimmed baking sheet. Bake wings at 425 for 25-30 min or until brown. (Whole chicken pieces needs to be baked longer, about 50 minutes to one hour.) You can make this a day ahead then cover with foil and reheat. Garnish with rosemary sprigs and sliced lemons to serve. Note: The chicken wings or pieces can also be grilled on a barbeque, which I often do in the hot summer months. 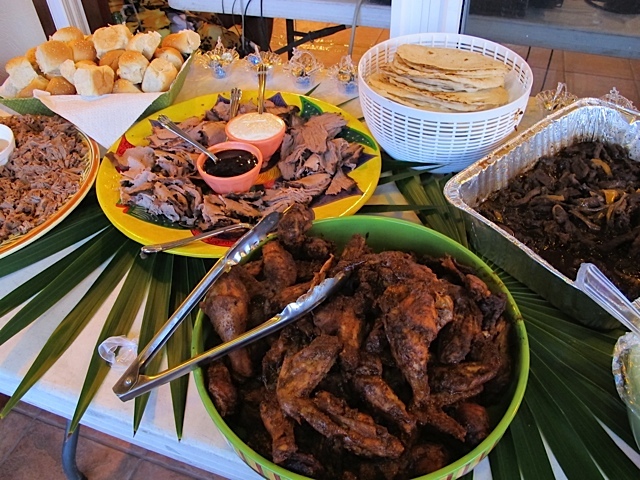 This entry was posted in Appetizer, Central America, Meat, Poultry and tagged appetizers, Belize, Chicken Wings, Poultry, Wedding. Bookmark the permalink. These chicken wings are to DIE for. I just made them this week, hoping they would last us a couple days and we ate all of them in one sitting. They are the perfect amount of spice and flavor. I am going to try the marinade on chicken breasts as well- I’m sure they will be delicious. I did marinate them overnight, which made them super flavorful. Try these!!!!!! Thanks, Shira. It’s an old but great recipe that I have made for a long time. So easy but different spices than the usual stuff. Glad you like them! Great story – looked like lots of fun. I have seen the whole garter on the girl who catches the bouquet in lots of American weddings . It may not have been required to do it with their teeth – but some do! I have been to several Belizean weddings and have never seen this so I wouldn’t be surprised if they got it from the US. I do wonder if it came from Central America? So many traditions cross over in different cultures. This was the first time I’ve seen anything like it though..and I have been to many, many types of ethnic weddings.